If you’ve been wondering what to do with that pile of Barbies and defunct foosball table lying in your basement, here is some very bizarre inspiration – the BarbieFoot Barbie Foosball Table! The super strange game table is the brainchild of french designer Chloe Ruchon and was presented at the DMY Youngsters Exhibition in Berlin as a toy that reinterprets a traditionally masculine game in a rather feminine way. The result is a plaything that allows children to think outside of gender barriers and simply focus on having fun. While it’s inconclusive whether or not the table was made of recycled materials, it is certainly great inspiration for anyone who is looking to breathe new life into outgrown toys. Read on for some truly imaginitive ways to create something special for your daughter or son by reworking what you already have. Okay, in all seriousness, we are pretty sure that you don’t have an extra foosball table and 22 spare Barbies on hand. But what if you have a few Barbies and accessories that your kids have outgrown? From transforming her iconic heels into adorable rings a la artist Margaux Lange to having her star in a birthday cake fit for a princess, the possibilities for upcycling Barbie are endless! What about households with a foosball table that is getting no love? 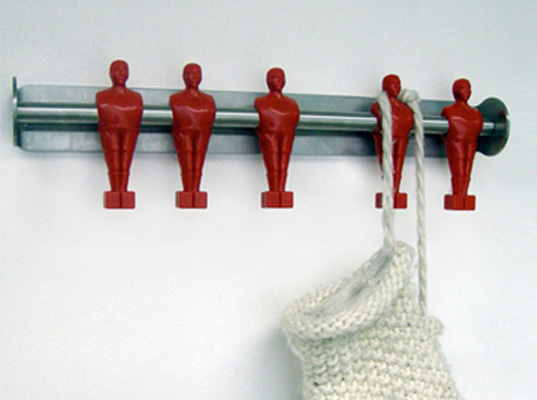 You might want to try your hand at recreating this spiffy coat rack by disassembling the table and using the soccer players heads as hooks. Or why not put an adult spin on your foosball table by revamping it into a coffee table like this one, but much, much less expensive? Simply cut the legs to about half height and cover with a piece of glass from a flea market or garage sale. 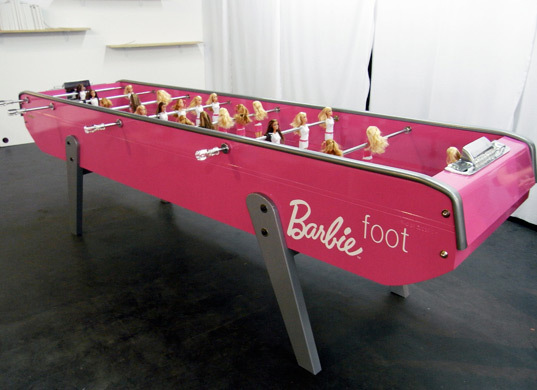 Bend it like Barbie?If you've been wondering what to do with that pile of Barbies and defunct foosball table lying in your basement, here is some very bizarre inspiration - the BarbieFoot Barbie Foosball Table! The super strange game table is the brainchild of french designer Chloe Ruchon and was presented at the DMY Youngsters Exhibition in Berlin as a toy that reinterprets a traditionally masculine game in a rather feminine way. The result is a plaything that allows children to think outside of gender barriers and simply focus on having fun.